For entities reporting under IFRS or FRS 101, December 31, 2018 marked the end of the first year in which the new IFRS 15 standard applied. IFRS 15 is a very significant and wide-ranging change that fundamentally alters the way revenue is recognised. It will affect the majority of companies reporting under IFRS or FRS 101. The standard became mandatory for all companies with accounting periods beginning on or after January 1, 2018. A major part of the changes is to reduce ambiguity and manipulation of when companies recognise revenue for tax or earnings purposes and standardise how these are to be reported on. This new reporting standard will introduce challenges for how companies record revenue particularly when it comes to understanding the timing of revenue recognition. 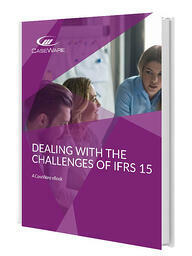 In our latest eBook we examine the changes introduced under IFRS 15 and the challenges companies will face in remaining compliant with the new reporting requirements.